Modern day York Co SC contains the location where my ancestors (Pattersons, Blacks, Harrisons, et al) lived during the 1760's through the early 1800's. It was originally known as Craven Co SC, then it was claimed by NC during the 1760's and 70's under the counties of Anson, then Mecklenburg, then Tryon. Once the boundary line was re-surveyed west of the Catawba River, it was deemed that this location was indeed within SC, and it was designated under the newly formed York County. For decades, it was also known as Camden District, which included many surrounding counties. Bullocks Creek is one of the main tributaries of the Broad River in this northern county. One of the main forks of Bullocks Creek is Clarks Fork, on the west side of Bullocks Creek. Both run north to south. Bullocks Creek starts east of Kings Mountain, while Clarks Fork starts within the modern boundaries of the Kings Mtn State Park. As Clarks Fork flows south, it passes near the town of Smyrna, SC. 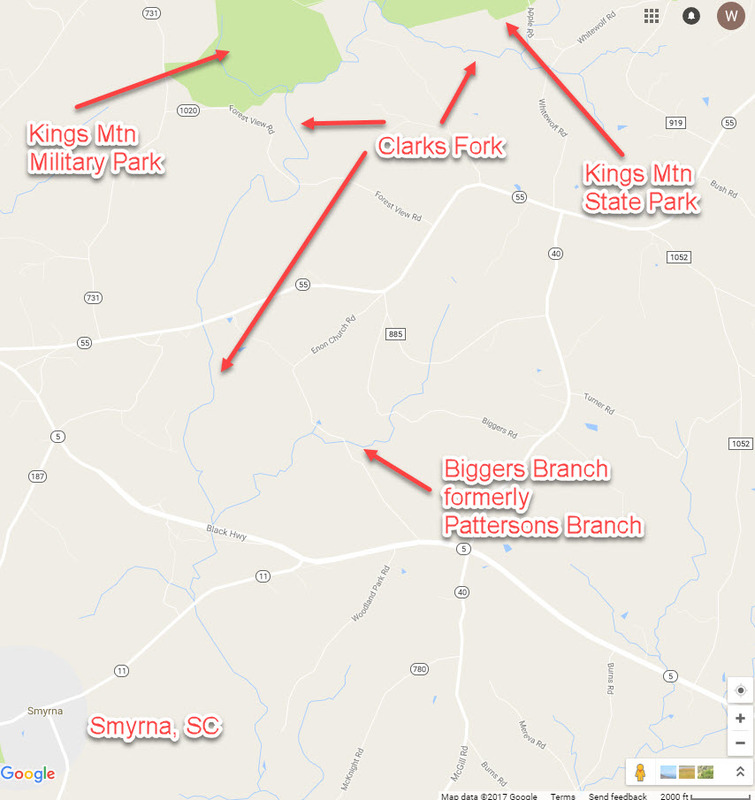 From Smyrna to Kings Mtn is a stretch of land that was heavily settled during the 1760's and later decades. This is ground zero for my Pattersons, and their relatives, the Harrisons, Blacks, Cravens, Ponders, et al. While I'm not sure whether or not I descend from the Cravens or Ponders, I know I descend from the Pattersons, Blacks, and Harrisons. Over the last several years, Harald Reksten and I have obtained many land records. Harald's efforts have been quite comprehensive. This includes grants, warrants, plats, and deeds - from both NC and SC - covering this Clarks Fork region. There are hundreds of records in question, and I recently narrowed the list down to a few hundred. In particular, I am concentrating on about 45 or 50 key tracts of land, and following the chain of title from one owner to the next as best I can. This is an on-going process, but it seems I have at least half, if not 2/3 of the plats in question already. I will soon be ordering the remaining plats, so that I can plot all of these tracts of land in my Deedmapper program. My attempt will be to isolate precisely where these key families lived. More to come on this later. I will build in links to new pages for each person above as more information becomes clear.